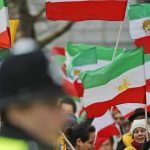 Supporters of MEK, rally in London in solidarity with Iran Protests at home. MSNBC’s coverage of recent protests in Iran lacked the objectivity necessary to provide its audience with accurate, factual evidence on the situation in Iran. On the 25th of May, the network broadcasted its “On Assignment” program. The program, narrated by Richard Engel, repeated the Iranian regime’s false narrative on the protests, even going as far as to include a notorious agent of the regime as a key witness. The coverage presented unfounded allegations about the Iranian opposition movement, the MEK, including that it carries out acts of torture. It also framed the prospect of change in Iran as a purely American adventure, overlooking the many protests that have racked the country in recent months, and continue to rack the country on a daily basis. The report was forthcoming in allegations against the People’s Mujahedin Organisation of Iran (MEK) and the National Council of Resistance of Iran (NCRI), however, it failed to mention many important facts. 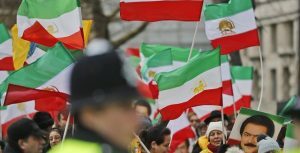 It tried to depict the activists involved in the resistance movement as violent brutes but declined to mention that the NCRI and particularly the MEK are the prominent victims of the violence in Iran, with the regime executing as many as 30,000 of its members in the single summer of 1988. In total, as many as 120,000 members of the MEK have been arbitrarily executed at the hands of the regime. Many more have been imprisoned on jumped up charges and face harassment from the regime on a daily basis. The program went on suggest that the Trump administration is careering towards a war with Iran, driven on by the NCRI’s encouragement. The reality couldn’t be further from the truth. The MEK and the Iranian opposition has asserted time and time again that it does not want war. The leaders of the movement, including Maryam Rajavi, have publicly appealed against military intervention. The “On Assignment” program also claimed that the MEK was involved in the death of six American military personnel and contractors that occurred in the 70s in Iran, also claimed that MEK was involved in the hostage-taking after the 1979 revolution. These claims were discredited in 2006 in an independent study from the Iran Policy Committee. Based on the independent study, The MEK leaders and most of its members were in Shah’s prisons when the assassinations took place by a separatist group that had taken over the organization in the absence of all its leaders who were in Prison at the time. They had hijacked the name of the organization, changed its ideology to Marxism and even murdered some of the members who resisted their take over. MEK had no role in the alleged assassinations. The Iran Policy Committee also found that the MEK had no part in the embassy takeover. In reality, the whole incident was orchestrated by the clerical regime to turn public opinion against, and then suppress, the Iranian opposition. This reassessment of the circumstances around the 1979 embassy takeover led the State Department to revoke its designation of the MEK in 2012 after it found no evidence of terrorism carried out by the MEK or the NCRI. Instead, it acknowledged the MEK as a legitimate resistance movement. Had MSNBC consulted members of the House and Senate, it would have quickly discovered that rather than a violent and aggressive organization, the MEK is a peaceful and legitimate resistance movement. Hordes of scholars and writers have publicly debunked the falsehoods and misinformation disseminated by the clerical regime about the MEK. Conducting basic research would have exposed much of MSNBC’s assertion as false. 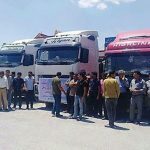 The nationwide truck drivers strike enters it’s second week despite increasing repressive measures by the regime. 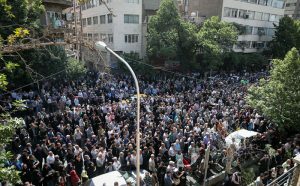 On Monday, May 28th, Our Iran published a report on the protests that took place in Iran last week. More than 489 protests were held in the one week period, with an average of 69 protests each day. Truck drivers, workers, and others who have suffered at the hands of the Iranian regime turned out in droves in cities across Iran to protest the economic policies of the corrupt government. 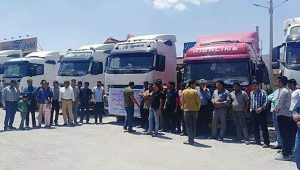 Based on reports from the MEK network, on May 22nd, truck drivers from several cities went on strike, pledging to continue the strike until their demands were met. Truck drivers cited a number of reasons for their strike, including low freight weights, unjust cargo distribution, reduced driver wages, and excessive price increases for tires and spare parts. The strike has been massive in scale, taking place in at least 242 cities and 31 provinces. A total of 406 protest activities by the striking drivers have been held over the first six days of the strike. The cohesiveness of the striking drivers and their actions to prevent other drivers from breaking the strike have been notable. Also worth noting is the drivers’ refusal to submit to government intimidation, even in the face of beatings by government agents. The effects of the strike were almost immediate, with fuel shortages beginning on the second day of the strike. Some gas stations were forced to close completely, while those who remained open had long lines. On the fifth day, bus drivers in several cities began to strike in solidarity with the truckers. Drivers working for factories and companies also joined the strike, causing shutdowns and disruptions in the affected businesses. 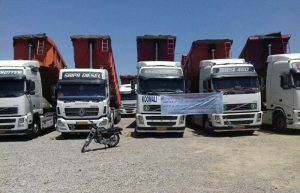 Caspian Steel truck drivers in Sirjan. Tehran markets were disrupted last week by strikes by Jafari Market, Soltani market and Amir Kabir market. Some malls also participated in the strike, as well the Qom, Isfahan, Jolfa and Maku markets, which shut down their shops. The strike was in protest of the stagnant financial market caused by the regime’s policies. Traverse Railway strikes have been ongoing and continued last week. 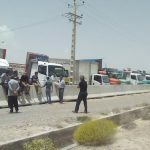 Workers in Semnan, Shahroud and Damghan are participating in the strike, which is in protest of nonpayment or delayed payment of wages and rising insurance premiums. 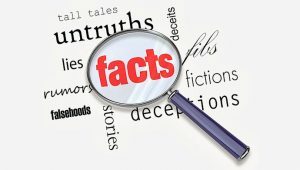 On Saturday, May 26th, the National Council of Resistance of Iran U.S. Representative Office (NCRIUS) published a rebuttal to the outrageous allegations made in a program that aired on MSNBC on May 25th. The program in question was Richard Engel’s “On Assignment”, included a number of old and debunked allegations about the MEK, which is the largest member of the NCRI. The program relied on claims made by Masoud Khodabandeh, a long-standing known operative of the Iranian regime’s Ministry of Intelligence and Security (MOIS). Khodabandeh has been used repeatedly by the Iranian regime to further its demonization campaign against the MEK, and his allegations have been proven false repeatedly. The recent uprising and continuing protests by the Iranian people have made it clear that they want regime change and that they support the resistance movement, which includes the MEK, as its backbone. The regime finds itself in a desperate position and has increased its efforts to delegitimize the MEK and stave off the revolution. 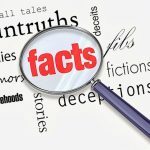 Part of this effort to demonize the MEK includes planting false narratives in Western media about the MEK and its goals, in an attempt to frighten away potential allies of the resistance. These falsehoods have all been debunked in the past. In addition, it is important to note that the MEK does not desire U.S. military involvement in toppling the Iranian regime. The organization is capable of this without outside intervention. The NCRIUS responded to the false allegations made on MSNBC point by point. It has been established by numerous sources (including a report commissioned by the Library of Congress) that Masoud Khodabandeh and his wife, Anne Singleton, are MOIS agents working for the Iranian regime. Witnesses have seen Ms. Singleton doing the work of the regime on several occasions. The MEK flatly denies allegations that it has taken money from Saudi Arabia or any other foreign government. The MEK relies on its members to finance its activities and challenges anyone to prove otherwise. According to a 2013 independent study by the University of Baltimore and a 2014 Council on Foreign Relations backgrounder, the MEK was not in any way involved in the deaths of U.S. service members in Iran. In fact, the assassins responsible for the U.S. deaths also assassinated several MEK leaders. These assassins later confessed to these crimes and were executed by the Shah’s regime. Iran’s Supreme Leader after the 1979 revolution, Ruhollah Khomeini, engineered the hostage crisis in order to consolidate power and crush the MEK. Masoumeh Ebtekar was a Spokesperson for the hostage-takers and is now a member of President Rouhani’s cabinet. She confirmed that the MEK had no role in the hostage crisis. The MEK denies making payments to Americans, and an investigation by the U.S. Treasury Department confirmed this. The 2012 investigation concluded that Iranian-Americans exercised their First Amendment rights in organizing events where U.S. officials spoke and broke no laws in doing so. In 2010 the MEK filed the first of many court cases to challenge its inclusion on the terror list, and court after court ruled in favor of the organization. In a final ruling, a federal court found no evidence that the MEK was involved in terrorist activities and gave the Secretary of State a deadline to issue a new decision. Otherwise, the court stated that it would delist the organization itself. The State Department refused to comply with the court order. 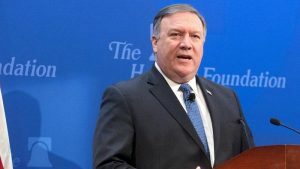 In response, the MEK filed the first successful writ of mandamus since 1803, which forced the State Department to delist the organization in 2012. The MSNBC piece was based on falsehoods that have been propagated by the regime and its surrogates for many years, despite being easily disproved by the public record. The regime hopes that by continuing to demonize the MEK they can prevent the inevitable downfall of their oppressive reign. But after the uprising that began last year and spread to 140 cities across Iran, it is obvious that this strategy will not be successful, despite their efforts to spread propaganda in the Western world. The students at Zahedan Azad University used their voices to stand up against the public humiliation of Iran’s Baluchi citizens. Many of Iran’s Sunni and minority communities suffer from state-endorsed discrimination. Prominent Baluchi religious leaders have been killed in recent years under suspicious circumstances. This has prompted many to question the regime’s involvement in their deaths. On Saturday, May 25th the students joined other members of the public in expressing their frustration and dismay at the regime’s abhorrent discriminatory measures. They chanted “do not be afraid, we are all together,” and carried banners against the degradation of ethnic minorities. Agents of the regime arrested a number of students involved in the demonstrations. Leader of the Iranian opposition, Maryam Rajavi, offered words of encouragement and support to the students and their compatriots. She denounced the regime, expressing “shame and hatred” for the clerical regime which “is the main source of discrimination and disunity in Iran today”. The President-elect of the Iranian Resistance and leader of the People’s Mujahedin Organisation of Iran (MEK) also called on the youth of the Baluchi and Sistan communities, as well as those in other communities across Iran, to stand in solidarity with the brave protestors of Zahedan. 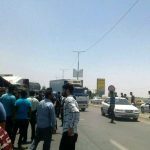 The protests in Zahedan, as well as recent truck driver protests, farmers protests, and student movements across the country, demonstrate the public’s desire to express their anger at the regime at every public opportunity. 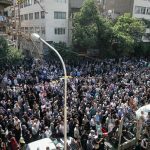 On Sunday, May 27th those gathered in attendance at the funeral of Naser Malek Motiei also used their voices to show their displeasure with the regime. Naser Malek Motiei was a prominent Iranian cinema star who was isolated and attacked by the regime for refusing to concede to its unpopular policies. He used his art to show his displeasure with the regime, and it cost him four decades of his career. In an attempt to curb the protests, the regime dispatched anti-riot forces who tried to intimidate those in attendance with tear gas and shots fired into the air. The people were undeterred and continued the ceremony, adding chants of “shameless, shameless,” into their chorus. Until the Iranian regime falls, the public will continue to vent their frustrations at every opportunity presented. The protests will only intensify until the current status quo is brought to an end. A new study was written by Dr. Ramesh Sepehrrad, a scholar-practitioner at the School of Conflict Analysis and Resolution (SCAR) at George Mason University, published in the journal E-International Relations on May 21st draws attention to the growing unrest in Iran. The uprising that began last December gave voice to a growing number of Iranians who are tired of the regime’s shallow claims of reform and are demanding regime change. Sepehrrad’s paper discusses the roots of the uprising, the reason for its widespread impact, and its potential to start a revolution in Iran. According to Sepehrrad, the recent uprising in Iran began with a protest in the northeastern holy city of Mashad over rising food prices and quickly spread into a massive uprising that took place in 140 cities across Iran. During the two weeks before the regime temporarily suppressed the uprising, the scope of the protests grew from economic conditions to inequality, to corruption, and finally to calls for regime change. The people protesting came from all walks of life, but the first protests were led by Iranians from the lower middle-class whose standard of living has decreased dramatically in recent years. They were joined by large numbers of women and youths who rose up in solidarity with those struggling through poor economic conditions. As the uprising grew, more people joined the ranks of protesters, including members of Iran’s many ethnic groups, including Turks, Kurds, Turkmen, Arab, Taleshi, Baluch, Lor, Bakhtiari, and Ghashghai, and the uprising began to look more like a coordinated effort and less like scattered protests. The regime attempted to paint the protesters as looters and criminals, but, as Sepehrrad wrote in her paper, this argument was invalidated by the fact that no looting occurred. The uprising was well-organized and goal-oriented, not a few protests by the poor and desperate. Sepehrrad pointed out that Iranian regime’s Supreme Leader, Ali Khamenei later acknowledged the role of the MEK in the uprising in an attempt to frighten people and prevent further protests. The regime’s record of brutality to the MEK is well-documented. In the summer of 1988 alone the regime executed 30,000 political prisoners, most of whom were MEK members. 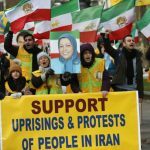 By acknowledging the MEK’s role in the uprising, the regime hoped to discourage protesters who did not want to meet the same fate as the tens of thousands of MEK members who have been targeted by the mullahs, but instead, they inadvertently lent credibility to the resistance organization and its goal of regime change. According to Sepehrrad, the December 2017/January 2018 uprisings were unique in several respects. For one thing, the protests were widespread, occurring in 140 cities over the course of two weeks. Protests occurred both in cities and in more rural areas. This was partially due to the use of social media, specifically Telegram, to spread the word of the uprisings. Government censorship efforts tend to cluster in the larger cities in Iran, so protesters in smaller cities were able to bypass state censors to get their message out in a way that would not have been possible in Tehran. The Revolutionary Guards Corps (IRGC) is also more densely clustered in larger cities, meaning that protests in small cities were not quickly or easily suppressed before word could spread. In addition, the protests began because of frustrations with economic conditions. The poor are disproportionately located in smaller cities, so the places where protests could spread more easily were also the places where more people felt compelled to protest. Sepehrrad found that protesters also utilized social media to collect data about the uprising. This information is an invaluable resource for predicting future acts of resistance by the people. Sepehrrad claims that the data gathered during the uprising shows a new model of protest in Iran that encompasses diverse groups and locations. Sepehrrad also wrote about the unity shown by the protesters. People protested for many reasons, but all of the protesters were united by their desire for regime change. According to Sepehrrad’s research, 65% of protest signs seem during the uprising called for regime change. This was extraordinary for such a diverse group of people. The poor, women, young people, legitimate political groups, the labor movement, various ethnic groups, and representatives from every social class banded together to demand change. This sort of unity in protest has been seen historically in revolutionary settings. The data collected during the uprising provided a picture of the protesters and their goals. Sepehrrad found four major themes in her analysis of the data. Unlike previous uprisings, the protesters in the recent uprising had no desire to negotiate with the regime for concessions. They demanded nothing less than regime change. The uprising was an organized nationwide movement, with protests occurring all over Iran, not just in the cities. Social media played a huge role in the uprising, in part because the protesters were able to flip the script and transfer the fear of retaliation from the protesters to the regime by documenting protests and communicating in a medium that could bypass the regime’s attempts at censorship. The unity displayed by a diverse group of protesters has unleashed sentiments of revolution across Iran. Protesters shared the common goal of regime change, but Sepehrrad found that there were a number of different issues that led people to rise up. Economic conditions caused many people to rise up. The lower middle class made up a large percentage of protesters because this group has been forced into poverty by the regime’s policies. Under the ruling regime, economic disparities between regime officials and their families and the rest of the country have disillusioned many Iranians. The regime has been accused of financial corruption, leading to unequal access to wealth that has caused widespread poverty amongst Iranians. Numerous allegations of corruption by the members of the regime have been made, and these claims have been substantiated by a report by Transparency International, which ranked Iran 131 among 178 countries. According to Sepehrrad‘s research, 40% of Iranian citizens in large cities live below the poverty line, and 60-70% of people in smaller cities and towns live in poverty. Young people, educated women, and college graduates are chronically unemployed or underemployed, with the regime acknowledging a 35% unemployment rate among the nation’s youth and a 52% unemployment rate among women. In addition to the epidemic of poverty, Iran’s housing crisis has been unaddressed by the regime, leaving many living in dire conditions. Sepehrrad estimated that 25% of the population has been affected by this crisis. The environmental crisis caused by the regime has compounded the inhumane living conditions faced by the people. According to Sepehrrad, the regime’s mismanagement has led to the drying of 90% of the country’s wetlands, leaving many without access to water. The increased access to the Internet and social media drove many to demand change. Despite the regime’s efforts to censor online material, Iranians have found ways to connect with each other and the larger world. These people, particularly women and educated youth, see the disparity between the rights enjoyed by people in other countries and the oppression and inequality experienced within Iran. They protested for greater individual freedoms, freedom of the press and freedom of association. According to Sepehrrad, the increase in access to online information has also given the Iranian people access to unbiased news, and not just the propaganda published by the state. This has drawn attention to the 1988 massacre of political prisoners, a majority of whom were MEK members. Some of the biggest sites of protests were in cities where mass graves of the executed 1988 political prisoners were located. Sepehrrad added that increased access to social media has also led to greater awareness of the plight of political prisoners. Word travels fast on the Internet, and now when someone is detained for the crime of speaking their mind, the rest of Iran knows about it. Iran’s abysmal human rights record (17 out of 100 points, according to Amnesty International) has led many to feel that Iran is unreformable. For many, the only solution to Iran’s problems is regime change. This sentiment, expressed by a large and diverse group of Iranians spread across the country, is the main ingredient of a revolution. Protests did not end when the uprising was suppressed and continue each day in cities across Iran. In late January of 2018, protesters began using a secure crowdsourcing tool to communicate with each other about upcoming protests, resistance efforts, and the current locations of security forces. They also take videos of events in Iran to share with the rest of the world. Sepehrrad noted that the use of purposeful collective action has been a factor in the uprising and continuing protests. Protesters have unified to act against the state in a coordinated fashion. Sepehrrad wrote that targets of these actions include “local religious leaders and centers, security forces and personnel, government-controlled financial institutions and banks, judicial branches, and government offices.” Protesters have taken down and burned images of the Supreme Leader in numerous cities. This action, in particular, has energized the resistance movement. Collective action is still occurring in Iran as part of ongoing protest efforts. 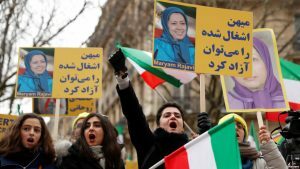 According to Sepehrrad and the regime itself, Tehran has placed responsibility for the uprising on the MEK, who did indeed play a large role in organizing protests. But the seeds of dissent have been present among the people of Iran for decades. The MEK is simply an expression of the dissatisfaction of the people with the current regime. The MEK has long been a target of the regime’s wrath, wrote Sepehrrad, as they are the largest and oldest resistance movement in Iran and have had success in opposing the mullahs’ rule. The regime has spent significant time and political capital in an attempt to delegitimize the movement and have claimed repeatedly that the MEK has been diminished and has little influence or support from the Iranian people. But the recent acknowledgment by the regime of the MEK’s role in the growing unrest runs counter to their argument that the MEK does not speak for the people. The large and widespread uprising that took place clearly shows the will of the people, and their goals align with the MEK and its longstanding position that meaningful change can only happen with the end of the mullahs’ rule. Sepehrrad’s paper demonstrates that the uprising and continuing protests in Iran are not scattered acts of resistance. The large-scale nature of the protests, their continuance despite attempts by the regime at suppression, their diverse makeup, and the unity displayed by the protesters point to revolution. The use of social media has made Iranians more aware of their shared concerns and has enabled them to organize more effectively. The people have no desire to negotiate with the regime. Their message is clear. Revolution is the only way to bring true reform to Iran. Sepehrrad’s paper may be read in its entirety on the E-International Relations website. The nationwide truck drivers strike enters its fifth day. 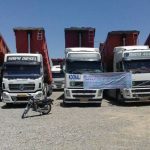 The truck driver protests escalated on their fourth day to include 177 cities, spread across 29 of the country’s provinces. 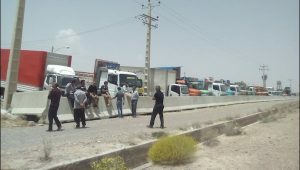 The protests began on Tuesday, the 22nd of May when drivers in 70 of Iran’s cities turned off their engines in protest. By Friday the 25th of May, the demonstration had swelled as truck drivers, minicab drivers, and taxi drivers from other cities around the country joined the protests in earnest. The protestors have been explicit in their demands. They want their wages to increase, retirement after 25-years of work, lower tariffs, and no competition from drivers working for the State Security Force. Rising tariffs and freight charges have been a significant economic burden for Iran’s truck drivers. Iran’s economy is in turmoil and arbitrary charges from regime officials at terminals are strangling the logistics and shipping industry. As the protests swelled to 177 cities, the clerical regime tried to diminish the impact of the strike by using tankers owned by the Iranian Revolutionary Guards Corps (IRGC). However, their plans failed when protestors in several cities successfully blocked the tanker’s movements. The regime also used threats in an attempt to break the strike. Workers from the National Oil Products Distribution Company in the province of Isfahan were told they would lose their jobs if they joined the strike. The drivers ignored the warnings and proceeded to join the strike. Conflict erupted between fuel tank drivers and the regime’s agents. 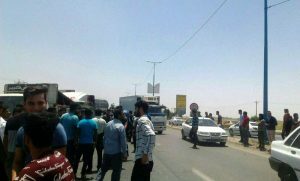 In Isfahan clashes occurred between the two sides, exacerbated by the regime’s threats against those involved in the strike. The intimidation tactics are an indicator that the strikes have caused the regime concern. There are even signs of concessions. Tasnim, the state-run news agency, quoted Dariush Armani of Iran’s Road Maintenance and Transportation Organization. He said it was “reasonable” for the drivers to demand a pay increase, as the costs associated with transportation rose. Early in the protest, Maryam Rajavi, leader of the Iranian opposition, extended her support to the country’s brave truck drivers. The leader of the People’s Mujahedin Organisation of Iran (PMOI/MEK) gave the drivers her blessing and urged the people of Iran to stand with them in their struggle against the regime. The National Council of Resistance of Iran (NCRI) also saluted the drivers, praising their resolve in the face of adversity and urging the Iranian public to support the protestors. On May 22nd, townhall.com published a piece by Soona Samsami on Trump’s withdrawal from the Iran nuclear deal. The article published under the title “After Nuclear Deal, the West Should Focus on Real Change”, highlighted the rise of the pro-democracy movement in Iran and urged the international community to reassess its stance towards the Iranian regime. Samsami, the U.S. representative of the National Council of Resistance of Iran, argued that with the withdrawal of the US from the Joint Comprehensive Plan of Action (JCPOA), there is an opportunity for the international community to broaden the discussion. The JCPOA was negotiated to curb the Iranian regime’s nuclear program, first and foremost. With the deal’s looming failure, there is an opportunity to reach international consensus on a course of action which promotes democracy, peace, and security, not just denuclearisation. The leader of the Iranian opposition, Maryam Rajavi, was quoted in the article. She has often expressed concerns with the Iran deal. She believes that regime change is a prerequisite for “peace, democracy, security and stability”. The recent wave of protests that began in December 2017, and continues to rage across the country, has shown that creating stability and security in the Middle East, depends on more than just an effective denuclearisation deal. 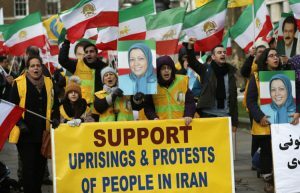 The People’s Mujahedin Organisation of Iran (MEK) has organized highly-effective national protests which have mobilized Iranians from all walks of life. These outbursts of dissatisfaction from the Iranian public demonstrate the unpopularity of the regime in Iran. It presents an opportunity for the international community to end Iran’s nuclear ambitions once and for all; by helping the people, and the MEK, secure regime change and restores Iranian democracy. There have been recent indicators that the position of Rouhani and his mullahs is under threat. He phoned French President Emmanuel Macron and urged him to crack down on the National Council of Resistance of Iran’s (NCRI) activities in France. A week later, Ali Khamenei conceded publicly that the MEK had planned protests across the country. The regime has also attempted to repress dissent across the country by coming down violently on those that protest. In clear breach of international human rights laws, the regime has executed and imprisoned those that dare to protest in the streets. 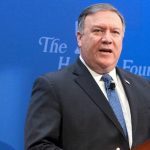 The plight of the Iranian people has attracted support from prominent figures in the Trump administration, including Secretary of State, Mike Pompeo, and John Bolton. Public events organized by the Iranian opposition across the globe also draw in large numbers in support of the cause. The annual rally in support of the Iranian opposition near Paris, which is held on June 30th at Villepinte this year, usually draws numbers of over 100,000. The conditions in 2015, when the Iran nuclear deal was negotiated, were drastically different from those in the country today. The deal at a time when the survival of the clerical regime appeared much more concrete. International heads of state believed they would be dealing with the regime for the foreseeable future and had little margin for negotiation beyond curbing its nuclear program, which has now proved to be a mistake. Today, the survival of the regime looks in doubt. 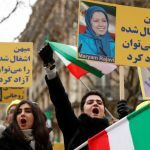 Protests are intensifying and the well-organized opposition of the MEK are pushing for the regime’s overthrow. This is an opportunity for the Western world to support the Iranian people in their quest for democracy and regime change. Only then can they be sure that Iran will be free from nuclear weapons, and the stability of the Middle East will be improved. Allowing the regime to remain in power and pushing forward with an ineffective deal will only lead to more chaos, routine human rights abuses, and instability throughout the Middle East.